Christmas Fantasy at Okinawa Zoo brings all the traditional trappings of Christmas to people on sub-tropical Okinawa as close as it can get. 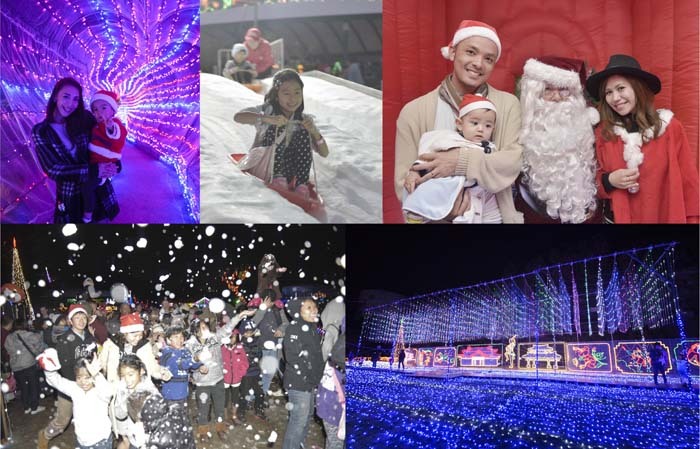 Although chances for a white Christmas on Okinawa are rather slim, the annual Christmas Fantasy at Okinawa Kodomono Kuni, a.k.a. Okinawa Zoo, is ready to entertain visitors with the next best thing. People experiencing their first winter on Okinawa are often surprised, and even disappointed to discover that Christmas on this sub-tropical island lack most of the trappings they are used to back home. No wonder, Christmas is not a part of Japanese traditions. In a matter of fact, the Christmas Day is not even a holiday. Christmas Fantasy at Okinawa Kodomo-no Kuni boasts some of the best illumination displays on the island. But don’t to worry, say the Christmas Fantasy organizers at the Okinawa Zoo in Goya, Okinawa City. From Dec. 23rd through 28th, from 16:00 to 21:30 each day, there is a huge Christmas Wonderland open at the zoo. The zoo is celebrating its 20th annual Christmas Fantasy event with holiday cheer, sparkling lights, illuminated Christmas trees and decorations guaranteed to give everyone a fuzzy, nostalgic feeling to celebrate the holiday season. The highlight of this annual event is a chance to revel in the beauty of real white snow falling from snow machines three times each evening, guaranteed. 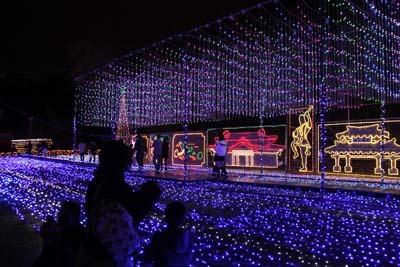 The Christmas Fantasy event brings to Okinawa Kodomo no Kuni huge numbers of LED illuminated decorations that cover almost the entire park. 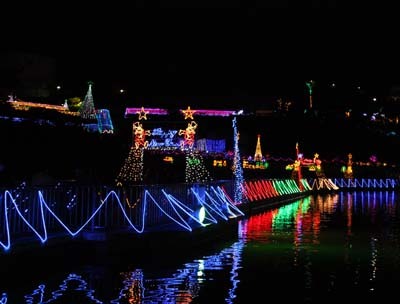 The park is divided into many special theme areas including Santa Claus, electric flower field, illuminated amusement park, illuminated Tunnel of Love among others. There are also pay play areas in its park of snow where visitors can play in a snow field, whiz down sliders, enjoy a snowman, visit an igloo made of real snow and more. Christmas Fantasy is divided into several areas that cover almost the entire park. The snow show takes place three times each day! A snow making machine runs around the park making snowfalls, something that is fun for kids but also adults enjoy. Snowing shows take place at 17:30, 19:15 and 20:40 each day. Street dance, Eisa, and bingo games are staged three times every day, as is a fantastic ‘Super Aurora’ laser beam show, the largest of its kind on the island, at 18:15, 19:50 and 21:15 each evening. The novelty this year, albeit a little strange thinking of Christmas, is the ‘Horror Night Zombie Street’ that could be a bit scary, and a ‘Black Hole’ that promises ‘time travel to a fantastic space.’ Luckily, Santa’s abode is right next to them with a jingle bell that grant’s every visitor a wish. Christmas Fantasy advance tickets are ¥1,800, or ¥2,200 at the gate. 4-15-year-old kids; tickets are ¥1,000 in advance, or ¥1,200 at the gate. Children under three years of age are free. Advance tickets are available before December 23rd at CoCo stores, Coop Apre in Naha Shintoshin, Kadena ITT, MCCS Tours Plus, FamilyMart, and Lawson (code 84159) convenience stores, and Okinawa Expressway rest area kiosks. Visitors cannot bring any food or drinks to the venue. There is very limited space for parking in the vicinity of the zoo. Shuttle busses will be running every day of the event from Okinawa City Office and Koza Athletic Park.